-Aunt Nena's Sage Pomegranate in my 20W hot plate warmer in the 1st floor. A great strong tart scent. It's a fruity, herbal and refreshing smell. I think thus is the same as TBG Pomegranate Jubilee. 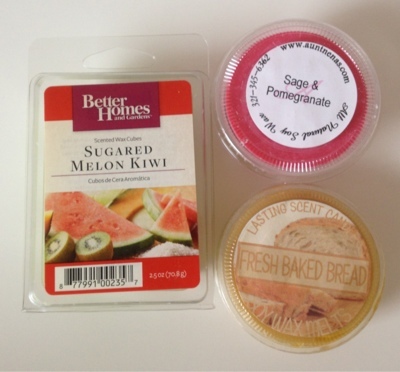 -Lasting Scent Candles Fresh Baked Bread in a tealight warmer in the kitchen. This was like the first tart from LSC that turned out to be somehow a dud. Smelled very faint of white bread and faded very quickly. -Better Homes & Gardens Sugared Melon Kiwi (2 cubes) on my 24W hot plate in the living room. I think this is by default a soft scent but it was sweet with a nice scent throw. Overall I was happy with this. Lasting power was average. 6-7 hrs perhaps.